and anyway, why would you have wanted to tell me anything? you might have another two years, but it would kill you by then. How stupid was that, wanting you to stay alive for him. These ziggurats of neatly taped-up boxes – burn them. its seams ripped along both shoulders. glittering with sea glass. Cook hot dogs and gooey s’mores. drunk on Shakespeare and Yeats. it will all make sense someday. and valentines with illegible signatures. a sixth of my journals and drafts. a small, sweet morsel wrapped in tender raw silk. The phone scammer from India begs for her. of her computer; he will cure everything. Her friends ask daily, are you eating? though she wasn’t sure who called. the girlish joined-up signatures, the quirky scrawls. to the edge of the bed as he scrabbles for the tune. He never wanted to land. as he howled her name. Dad stumbled across the hall. Bathroom light soothed the hardwood floor. The bottle tapped the spoon. to safety. Dad never tilted the spoon too far. The man I love stands slightly behind me. I cough. He doesn’t seem to hear. Tracey S. Rosenberg’s debut poetry collection, Lipstick is Always a Plus, was published by Stewed Rhubarb Press in 2012. 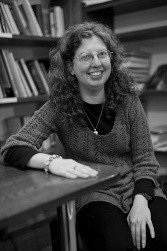 She won a New Writers Award from the Scottish Book Trust and has published poems in a variety of journals, including Gutter, New Writing Scotland, The Frogmore Papers, and the Journal of the American Medical Association. She lives in Edinburgh.